Cabin Rental Owner? We can help. 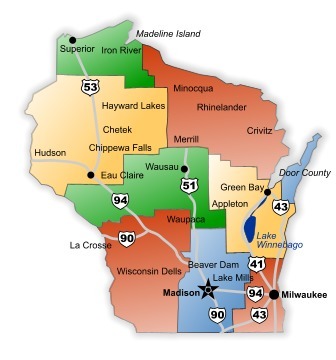 Wisconsin - a land know for its cheese, the Green Bay Packers and the Noble Prize winning author, Sinclair Lewis. Although we all have things that immediately come to mind when we think of Wisconsin, many people overlook its potential as one of the finest vacation destinations in the world. With quiet forests, abundant wildlife, crystal clear lakes, world-class fishing, unique cultural activities and personable, charming towns folk, Wisconsin is the ideal vacation destination for individuals and families alike. 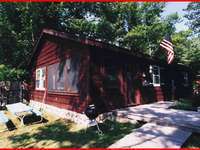 Wisconsin cabin rentals offer travelers the opportunity to immerse themselves in the scenic beauty of nature without having to endure crowded, overrated tourist traps and claustrophobic hotel rooms. So, what are you waiting for? Plan your next vacation to Wisconsin, relax and enjoy some quality time with your friends and family in one of the most memorable vacation destinations of North America! The Hayward Region of Wisconsin is a place where visitors can come year after year to truly relax and get away from it all. Local residents here are always friendly and welcoming; a pleasant reminder of a bygone age. In fact, many visitors find it easy to pass several hours in local coffee shops and restaurants simply absorbing the charming ambiance created by these hospitable folks. Fishing here in some of the best Wisconsin has to offer with lakes brimming with pike, walleye, bass and a variety of other fish species. Summer brings outdoor pastimes such as wave-riding, swimming, boating or simply basking in the sun by one of the many area lakes. Visitors may initially be hesitant to plan a trip to Wisconsin in the winter season; however, with countless activities such as snow mobiling, ice fishing and skiing, along with the peace of the wintry pine forests, it is actually an ideal time to visit the Wisconsin Northwoods. Home to the National Fresh Water Fishing Hall of Fame and the world renowned Lac Courte Oreilles Indian Casino, visitors will find plenty of amusements in addition to the serenely beautiful countryside and lakes. 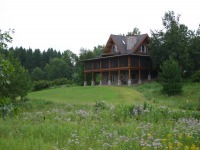 Located near the Chequamegon National Forest in northwestern Wisconsin, Hayward and its surrounding area offer travelers a respite from the ordinary vacation; an opportunity to sit back on the deck of your vacation home, relax and experience the tranquility of the Wisconsin Northwoods around you. Comprised of twenty-two islands in Lake Superior, the Apostle Islands National Lakeshore is an incredibly beautiful spot to settle for your next vacation. The picturesque lakeshore town of Bayfield, otherwise known as the gateway to the Apostle Islands, is located just to the south of this designated national lakeshore. The equally amiable city of Washburn lies minutes south of Bayfield. Visitors to the Bayfield and Washburn areas can cruise around the islands on a chartered boat, kayak on the lake to one of the water-sculpted sea caves, hike on the beautiful Meyers Beach, pick peaches or blueberries at a local orchard, stroll through the quaint and unique shops or enjoy a leisurely meal at one of the charming local dining establishments. Held annually in October, Bayfield's Apple Fest is an outstanding way to absorb some of the small town charm of this quaint city. In winter, visitors can enjoy the unique experience of hiking to the Lake Superior Ice Caves on the Bayfield Peninsula. The plethora of attractions and recreational activities in and around the Apostle Islands make this an excellent destination for families seeking to get away from it all during a stay in a private, cozy vacation cabin. For easy access to the culture and attractions of city life, consider renting a vacation cabin or condominium along the shores of Lake Michigan near Green Bay, Wisconsin. Not only is Green Bay home to the world-famous Packers, this city has countless other attractions guaranteed to please every member of your traveling party. From local wineries to botanical gardens and a zoo, Green Bay is a hub of fun cultural activities. Home to the National Railroad Museum and the newly renovated Lambleau Field, Green Bay has an attraction to suit everyone from the history buff to the zealous sports fan. Along the shores of Green Bay and Lake Michigan lie quiet, charming towns; perfect spots to rent a vacation cabin and settle in for a week or two of rest and relaxation. Nearby cities such as Kewaunee, Algoma and Two Rivers along the shores of Lake Michigan offer the perfect opportunity to get away from it all without sacrificing the attractions and culture of a larger community. 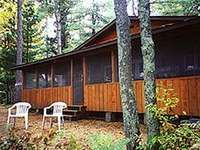 Renting a private, secluded vacation cabin in Wisconsin is a great way to spend your precious family vacation time. Why rush around to an overcrowded, touristy destination when you can relax in the comfort and charm of a vacation cabin set in a beautiful old wood pine forest or by a crystal clear lake? Your family is sure to cherish the memories of your next trip to a Wisconsin vacation cabin forever.